Quilts by the Thursday Friends . The Thursday Friends are a group of quilters who get together regularly to learn new techniques and to share ideas and projects. The group serves as volunteer coordinators for the annual fall quilt show at Olbrich Gardens in Madison and has made some of the large quilts which Olbrich raffles every year. Rosemary Schmidt, former MATC instructor, serves as facilitator of the informal group. Members are also part of the larger quilt guild of Madison, "Mad City Quilters." For this exhibit the Friends are pleased to add Rumi O'Brien's special story quilt to those done by members of the group. Quilts have been made for many hundreds of years. In this country the quilting tradition really took off in the nineteenth century as pioneer women sought interesting ways to use up fabric scraps while keeping their families warm. Over the years quilting evolved into a highly personal folk art form entailing craft as well as creativity, and exhibiting a wide range of traditional and innovative patterns. Quilts are composed of three layers: a top, a backing, and some kind of batting or filling. They are often described as a textile sandwich, and the quilting is actually the stitching that holds the three layers together and prevents the filling from shifting. Pieced quilts are quilts whose tops are made from the stitching together of many individual pieces of fabric. Applique quilts are made with a foundation fabric onto which many individual pieces are sewn. 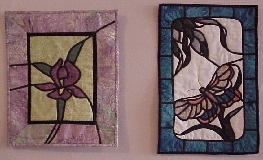 Quilts today can be HAND PIECED, MACHINE PIECED, HAND APPLIQUED, MACHINE APPLIQUED, and HAND QUILTED or MACHINE QUILTED. You will see examples and combinations of each in this exhibit. Quilting today involves more than just creating coverings for beds. Many traditional and contemporary designs are being made on a smaller scale as wall hangings, draperies, tablecloths, and clothing. The pieces on display here reflect this range, and demonstrate a wide variety of techniques. Rumi O'Brien's story quilt is an example of a large wall hanging completely hand appliqued and hand quilted. 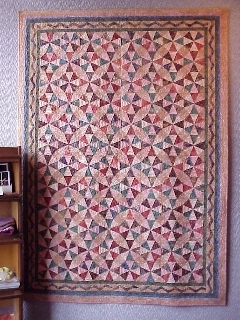 Ginny Riker's kaleidoscope is a bed-sized quilt which is machine pieced and machine quilted. The exhibit includes traditional patterns such as Wedding Ring, Mariner's Compass, Trip Around the World, and Stars, as well as more modern techniques such as Stained Glass, Bargello (tapestry-like), Watercolor (Monet inspired using small blended flower fabrics), and Three-dimensional Applique with folded fabric and embellishments. Amish people's frugal, simple life style. Amish quilts stand as a statement about peoplehood, hard work, and creativity and evoke a warm response to their beauty. 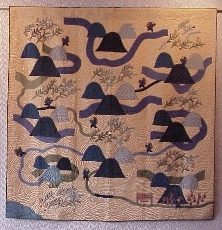 The exhibit also includes a style of quilting called the landscape quilt. With this modern technique the quilter essentially paints a picture with fabric and uses extensive machine quilting to help achieve depth and definition. 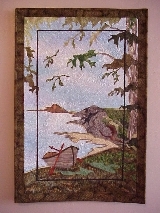 Donna Willadsen's landscape demonstrates these techniques using some of the many fabrics now on the market designed especially for quilters. Although many simple and utilitarian quilts are still made today, most contemporary quilts can be considered highly sophisticated art forms. The ability to design and to manipulate color, harmony, scale, pattern, and texture are skills inherent in the quilt artist. There are many quilt shows each year in the Madison area and in southern part of Wisconsin that showcase the talents of both men and women quilters. This exhibit was put together by the Thursday Friends. Exhibitors include: Theresa Acker, Janis Browning, Adelle Bilzing, Carolyn Cain, Bertie Lou Davis, Marilee Gardner, Carol Hanson, Becki Kurtz, Gini Riker, Rosemary Schmidt, Donna Willadsen, and story quilt designer, Rumi O'Brien.